ExpressRoute for Office 365 provides an alternate routing path to many internet facing Office 365 services. The architecture of ExpressRoute for Office 365 is based on advertising public IP prefixes of Office 365 services that are already accessible over the Internet into your provisioned ExpressRoute circuits for subsequent redistribution of those IP prefixes into your network. With ExpressRoute you effectively enable several different routing paths, through the internet and through ExpressRoute, for many Office 365 services. This state of routing on your network may represent a significant change to how your internal network topology is designed. You must carefully plan your ExpressRoute for Office 365 implementation to accommodate for the network complexities of having routing available via both a dedicated circuit with routes injected into your core network and the internet. If you and your team don't perform the detailed planning and testing in this guide, there is a high risk you'll experience intermittent or a total loss of connectivity to Office 365 services when the ExpressRoute circuit is enabled. To have a successful implementation, you will need to analyze your infrastructure requirements, go through detailed network assessment and design, carefully plan the rollout in a staged and controlled manner, and build a detailed validation and testing plan. For a large, distributed environment it's not uncommon to see implementations span several months. This guide is designed to help you plan ahead. Large successful deployments may take six months in planning and often include team members from many areas in the organization including networking, Firewall and Proxy server administrators, Office 365 administrators, security, end-user support, project management, and executive sponsorship. Your investment in the planning process will reduce the likelihood that you'll experience deployment failures resulting in downtime or complex and expensive troubleshooting. We expect the following pre-requisites to be completed before this implementation guide is started. You've completed a network assessment to determine if ExpressRoute is recommended and approved. You've selected an ExpressRoute network service provider. Find details about the ExpressRoute partners and peering locations. You've already read and understand the ExpressRoute documentation and your internal network is able to meet ExpressRoute pre-requisites end to end. The internet dependencies of SaaS services. How to avoid asymmetric routes and handle complex routing. How to incorporate perimeter security, availability, and application level controls. Start by determining which features and services you plan to adopt within your organization. You need to determine which features of the different Office 365 services will be used and which locations on your network will host people using those features. With the catalog of scenarios, you need to add the network attributes that each of those scenarios require; such as inbound and outbound network traffic flows and if the Office 365 endpoints are available over ExpressRoute or not. Catalog the inbound and outbound network traffic for the Office 365 services your organization is using. Consult Office 365 URLs and IP address ranges page for the description of flows that different Office 365 scenarios require. Gather documentation of existing network topology showing details of your internal WAN backbone and topology, connectivity of satellite sites, last mile user connectivity, routing to network perimeter egress points, and proxy services. Identify inbound service endpoints on the network diagrams that Office 365 and other Microsoft services will connect to, showing both internet and proposed ExpressRoute connection paths. Identify all geographic user locations and WAN connectivity between locations along with which locations currently have an egress to the internet and which locations are proposed to have an egress to an ExpressRoute peering location. Identify all edge devices, such as proxies, firewalls, and so on and catalog their relationship to flows going over the Internet and ExpressRoute. Document whether end users will access Office 365 services via direct routing or indirect application proxy for both Internet and ExpressRoute flows. Add the location of your tenant and meet-me locations to your network diagram. Estimate the expected and observed network performance and latency characteristics from major user locations to Office 365. Keep in mind that Office 365 is a global and distributed set of services and users will be connecting to locations that may be different from the location of their tenant. For this reason, it is recommended to measure and optimize for latency between the user and the closest edge of Microsoft global network over ExpressRoute and Internet connections. You can use your findings from the network assessment to aid with this task. List company network security and high availability requirements that need to be met with the new ExpressRoute connection. For example, how do users continue to get access to Office 365 in the event of the Internet egress or ExpressRoute circuit failure. 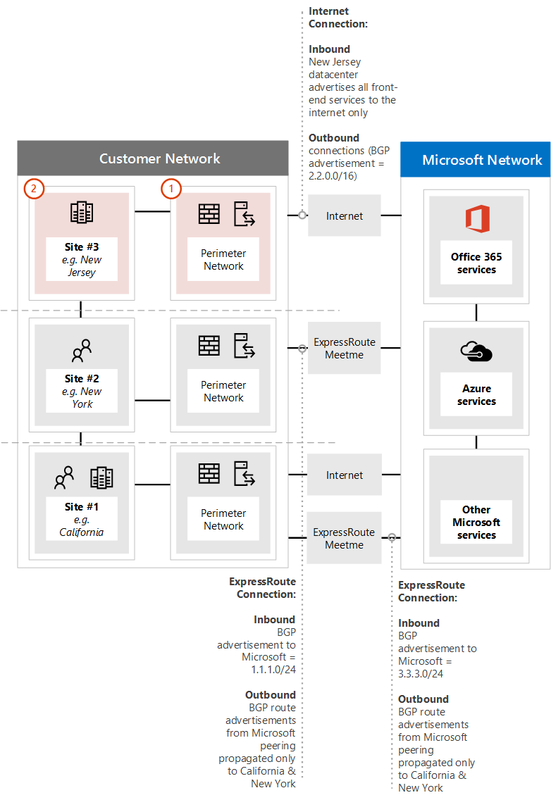 Document which inbound and outbound Office 365 network flows will use the Internet path and which will use ExpressRoute. The specifics of geographical locations of your users and details of your on-premises network topology may require the plan to be different from one user location to another. To minimize routing and other network complexities, we recommend that you only use ExpressRoute for Office 365 for the network traffic flows that are required to go over a dedicated connection due to regulatory requirements or as the result of the network assessment. Additionally, we recommend that you stage the scope of ExpressRoute routing and approach outbound and inbound network traffic flows as different and distinct stages of the implementation project. 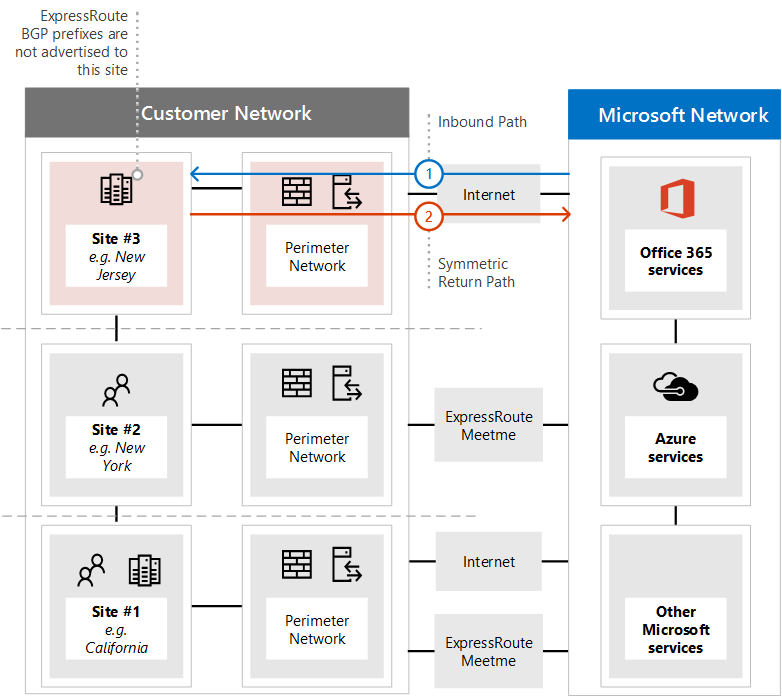 Deploy ExpressRoute for Office 365 for just user initiated outbound network traffic flows and leave inbound network traffic flows across the Internet can help to control the increase in topological complexity and risks of introducing additional asymmetric routing possibilities. Your network traffic catalog should contain listings of all the inbound and outbound network connections that you'll have between your on-premises network and Microsoft. Outbound network traffic flows are any scenarios where a connection is initiated from your on-premises environment, such as from internal clients or servers, with a destination of the Microsoft services. These connections may be direct to Office 365 or indirect, such as when the connection goes through proxy servers, firewalls, or other networking devices on the path to Office 365. Inbound network traffic flows are any scenarios where a connection is initiated from the Microsoft cloud to an on-premises host. These connections typically need to go through firewall and other security infrastructure that customer security policy requires for externally originated flows. 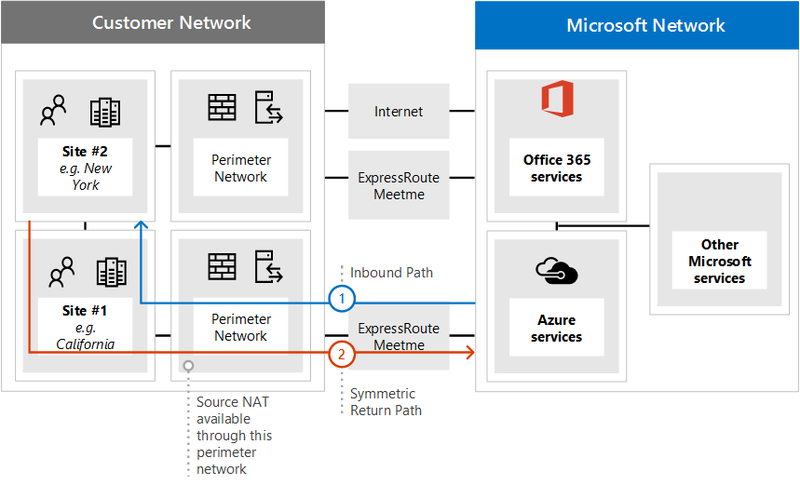 Read the Ensuring route symmetry section of the article Routing with ExpressRoute for Office 365 to determine which services will send inbound traffic and look for the column marked ExpressRoute for Office 365 in the Office 365 endpoints reference article to determine the rest of the connectivity information. For each service that requires an outbound connection, you'll want to describe the planned connectivity for the service including network routing, proxy configuration, packet inspection, and bandwidth needs. For each service that requires an inbound connection, you'll need some additional information. Servers in the Microsoft cloud will establish connections to your on-premises network. to ensure the connections are made correctly, you'll want to describe all aspects of this connectivity, including; the public DNS entries for the services that will accept these inbound connections, the CIDR formatted IPv4 IP addresses, which ISP equipment is involved, and how inbound NAT or source NAT is handled for these connections. Inbound connections should be reviewed regardless of whether they're connecting over the internet or ExpressRoute to ensure asymmetric routing hasn't been introduced. In some cases, on-premises endpoints that Office 365 services initiate inbound connections to may also need to be accessed by other Microsoft and non-Microsoft services. It is paramount that enabling ExpressRoute routing to these services for Office 365 purposes doesn't break other scenarios. In many cases, customers may need to implement specific changes to their internal network, such as source based NAT, to ensure that inbound flows from Microsoft remain symmetric after ExpressRoute is enabled. Here's a sample of the level of detail required. In this case Exchange Hybrid would route to the on-premises system over ExpressRoute. All user locations where Office 365 and other services will be accessed from. All internet and ExpressRoute egress points. All outbound and inbound devices that manage connectivity in and out of the network, including routers, firewalls, application proxy servers, and intrusion detection/prevention. Internal destinations for all inbound traffic, such as internal ADFS servers that accept connections from the ADFS web application proxy servers. Identify each location where people will access Office 365 from and list the meet-me locations that will be used for ExpressRoute. Locations and portions of your internal network topology, where Microsoft IP prefixes learned from ExpressRoute will be accepted, filtered and propagated to. The network topology should illustrate the geographic location of each network segment and how it connects to the Microsoft network over ExpressRoute and/or the Internet. The diagram below shows each location where people will be using Office 365 from along with the inbound and outbound routing advertisements to Office 365. Through a meet-me location in North America for the people in California. Through a meet-me location in Hong Kong for the people in Hong Kong. Through the internet in Bangladesh where there are fewer people and no ExpressRoute circuit provisioned. The selection of meet-me locations, which are the physical location where your ExpressRoute circuit connects your network to the Microsoft network, is influenced by the locations where people will access Office 365 from. As a SaaS offering, Office 365 does not operate under the IaaS or PaaS regional model in the same way Azure does. Instead, Office 365 is a distributed set of collaboration services, where users may need to connect to endpoints across multiple datacenters and regions, which may not necessarily be in the same location or region where the user's tenant is hosted. This means the most important consideration you need to make when selecting meet-me locations for ExpressRoute for Office 365 is where the people in your organization will be connecting from. The general recommendation for optimal Office 365 connectivity is implement routing, so that user requests to Office 365 services are handed off into the Microsoft network over the shortest network path, this is also often being referred to as 'hot potato' routing. For example, if most of the Office 365 users are in one or two locations, selecting meet-me locations that are in the closest proximity to the location of those users will create the optimal design. If your company has large user populations in many different regions, you may want to consider having multiple ExpressRoute circuits and meet-me locations. For some of your user locations, the shortest/most optimal path into Microsoft network and Office 365, may not be through your internal WAN and ExpressRoute meet-me points, but via the Internet. Often times, there are multiple meet-me locations that could be selected within a region with relative proximity to your users. Fill out the following table to guide your decisions. 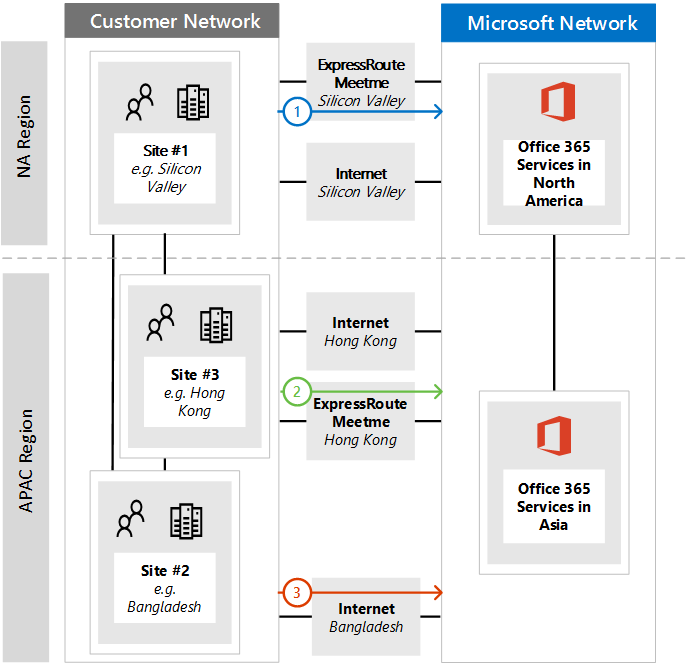 Once the global network architecture showing the Office 365 region, ExpressRoute network service provider meet-me locations, and the quantity of people by location has been developed, it can be used to identify if any optimizations can be made. It may also show global hairpin network connections where traffic routes to a distant location in order to get the meet-me location. If a hairpin on the global network is discovered it should be remediated before continuing. Either find another meet-me location, or use selective Internet breakout egress points to avoid the hairpin. Closest proximity to the people in their organization. Closest in proximity to a Microsoft datacenter where Office 365 is hosted. Expanding this concept slightly further, the second diagram shows an example multi-national customer faced with similar information and decision making. This customer has a small office in Bangladesh with only a small team of ten people focused on growing their footprint in the region. There is a meet-me location in Chennai and a Microsoft datacenter with Office 365 hosted in Chennai so a meet-me location would make sense; however, for ten people, the expense of the additional circuit is burdensome. As you look at your network, you'll need to determine if the latency involved in sending your network traffic across your network is more effective than spending the capital to acquire another ExpressRoute circuit. Alternatively, the ten people in Bangladesh may experience better performance with their network traffic sent over the internet to the Microsoft network than they would routing on their internal network as we showed in the introductory diagrams and reproduced below. Your implementation plan should encompass both the technical details of configuring ExpressRoute as well as the details of configuring all the other infrastructure on your network, such as the following. Plan which services split between ExpressRoute and Internet. Plan for bandwidth, security, high availability and failover. Decide how far ExpressRoute routes will be advertised into your network and what is the mechanism for clients to select Internet or ExpressRoute path; for example, direct routing or application proxy. Plan DNS record changes, including Sender Policy Framework entries. Plan NAT strategy including outbound and inbound source NAT. For your initial deployment, all inbound services, such as inbound email or hybrid connectivity, are recommended to use the internet. Plan end user client LAN routing, such as configuring a PAC/WPAD file, default route, proxy servers, and BGP route advertisements. Plan perimeter routing, including proxy servers, firewalls, and cloud proxies. Create a plan for bandwidth required for each major Office 365 workload. Separately estimate Exchange Online, SharePoint Online, and Skype for Business Online bandwidth requirements. You can use the estimation calculators we've provided for Exchange Online and Skype for Business as a starting place; however, a pilot test with a representative sample of the user profiles and locations is required to fully understand the bandwidth needs of your organization. Add how security is handled at each internet and ExpressRoute egress location to your plan, remember all ExpressRoute connections to Office 365 use public peering and must still be secured in accordance with your company security policies of connecting to external networks. Add details to your plan about which people will be affected by what type of outage and how those people will be able to perform their work at full capacity in the simplest manner. Skype for Business Online also has specific additional network requirements which are detailed in the article Media Quality and Network Connectivity Performance in Skype for Business Online. Read the section Bandwidth planning for Azure ExpressRoute in Network planning with ExpressRoute for Office 365. When performing a bandwidth assessment with your pilot users, you can use our guide; Office 365 performance tuning using baselines and performance history. Create a plan for high availability to meet your needs and incorporate this into your updated network topology diagram. 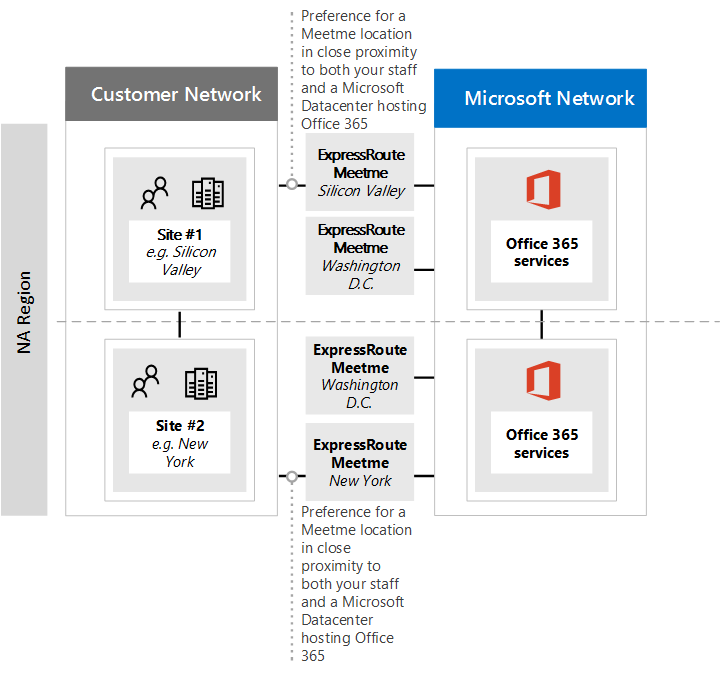 Read the section High availability and failover with Azure ExpressRoute in Network planning with ExpressRoute for Office 365. Create a plan to meet your network security requirements and incorporate this into your updated network topology diagram. Read the section Applying security controls to Azure ExpressRoute for Office 365 scenarios in Network planning with ExpressRoute for Office 365. ExpressRoute for Office 365 has outbound network requirements that may be unfamiliar. Specifically, the IP addresses that represent your users and networks to Office 365 and act as the source endpoints for outbound network connections to Microsoft must follow specific requirements outlined below. The endpoints must be public IP addresses, that are registered to your company or to carrier providing ExpressRoute connectivity to you. The endpoints must be advertised to Microsoft and validated/accepted by ExpressRoute. The endpoints must not be advertised to the Internet with the same or more preferred routing metric. The endpoints must not be used for connectivity to Microsoft services that are not configured over ExpressRoute. If your network design doesn't meet these requirements, there is a high risk your users will experience connectivity failures to Office 365 and other Microsoft services due to route black holing or asymmetric routing. This occurs when requests to Microsoft services are routed over ExpressRoute, but responses are routed back across the internet, or vice versa, and the responses are dropped by stateful network devices such as firewalls. The most common method you can use to meet the above requirements is to use source NAT, either implemented as a part of your network or provided by your ExpressRoute carrier. Source NAT allows you to abstract the details and private IP addressing of your internet network from ExpressRoute and; coupled with proper IP route advertisements, provide an easy mechanism to ensure path symmetry. If you're using stateful network devices that are specific to ExpressRoute peering locations, you must implement separate NAT pools for each ExpressRoute peering to ensure path symmetry. Read more about the ExpressRoute NAT requirements. Add the changes for the outbound connectivity to the network topology diagram. The majority of enterprise Office 365 deployments assume some form of inbound connectivity from Office 365 to on-premises services, such as for Exchange, SharePoint, and Skype for Business hybrid scenarios, mailbox migrations, and authentication using ADFS infrastructure. When ExpressRoute you enable an additional routing path between your on-premises network and Microsoft for outbound connectivity, these inbound connections may inadvertently be impacted by asymmetric routing, even if you intend to have those flows continue to use the Internet. A few precautions described below are recommended to ensure there is no impact to Internet based inbound flows from Office 365 to on-premises systems. To minimize the risks of asymmetric routing for inbound network traffic flows, all of the inbound connections should use source NAT before they're routed into segments of your network which have routing visibility into ExpressRoute. If the incoming connections are allowed onto a network segment with routing visibility into ExpressRoute without source NAT, requests originating from Office 365 will enter from the internet, but the response going back to Office 365 will prefer the ExpressRoute network path back to the Microsoft network, causing asymmetric routing. Perform source NAT before requests are routed into your internal network using networking equipment such as firewalls or load balancers on the path from the Internet to your on-premises systems. Ensure that ExpressRoute routes are not propagated to the network segments where inbound services, such as front end servers or reverse proxy systems, handling Internet connections reside. Explicitly accounting for these scenarios in your network and keeping all inbound network traffic flows over the Internet helps to minimize deployment and operational risk of asymmetric routing. There may be cases where you may choose to direct some inbound flows over ExpressRoute connections. For these scenarios, take the following additional considerations into account. Office 365 can only target on-premises endpoints that use public IPs. This means that even if the on-premises inbound endpoint is only exposed to Office 365 over ExpressRoute, it still needs to have public IP associated with it. All DNS name resolution that Office 365 services perform to resolve on-premises endpoints happen using public DNS. This means that you must register inbound service endpoints' FQDN to IP mappings on the Internet. In order to receive inbound network connections over ExpressRoute, the public IP subnets for these endpoints must to be advertised to Microsoft over ExpressRoute. Carefully evaluate these inbound network traffic flows to ensure that proper security and network controls are applied to them in accordance with your company security and network policies. 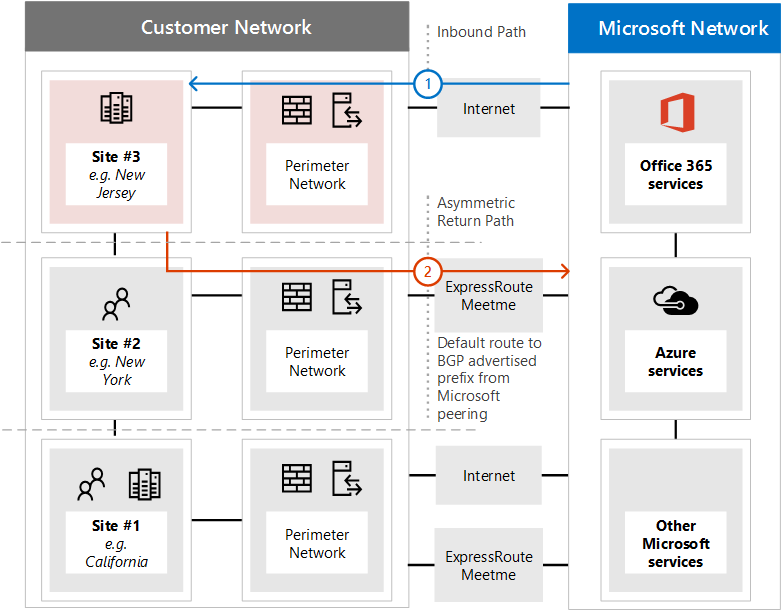 Once your on-premises inbound endpoints are advertised to Microsoft over ExpressRoute, ExpressRoute will effectively become the preferred routing path to those endpoints for all Microsoft services, including Office 365. This means that those endpoint subnets must only be used for communications with Office 365 services and no other services on the Microsoft network. Otherwise, your design will cause asymmetric routing where inbound connections from other Microsoft services prefer to route inbound over ExpressRoute, while the return path will use the Internet. In the event an ExpressRoute circuit or meet-me location is down, you'll need to ensure the on-premises inbound endpoints are still available to accept requests over a separate network path. This may mean advertising subnets for those endpoints through multiple ExpressRoute circuits. We recommend applying source NAT for all inbound network traffic flows entering your network through ExpressRoute, especially when these flows cross stateful network devices such as firewalls. Some on-premises services, such as ADFS proxy or Exchange autodiscover, may receive inbound requests from both Office 365 services and users from the Internet. For these requests Office 365 will target the same FQDN as user requests over the Internet. 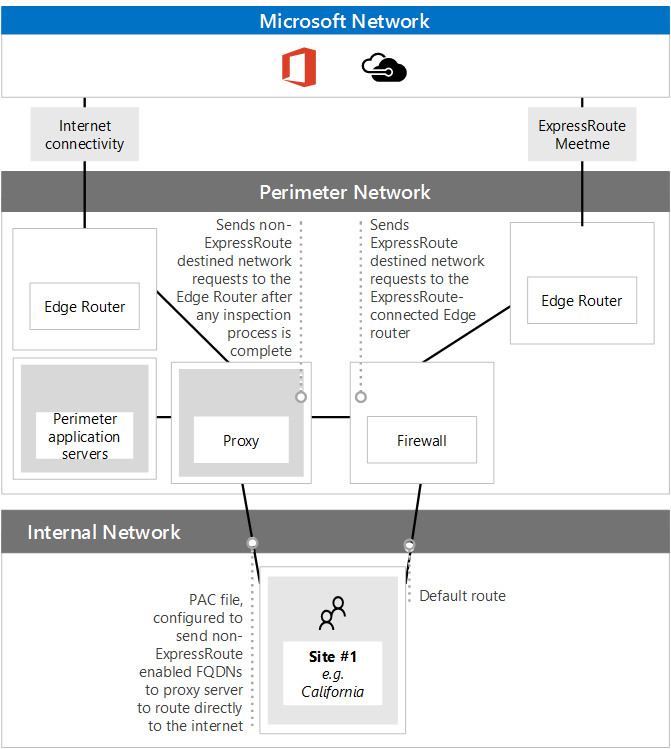 Allowing inbound user connections from the internet to those on-premises endpoints, while forcing Office 365 connections to use ExpressRoute, represents significant routing complexity. For the vast majority of customers implementing such complex scenarios over ExpressRoute is not recommended due to operational considerations. This additional overhead includes, managing risks of asymmetric routing and will require you to carefully manage routing advertisements and policies across multiple dimensions. You want to avoid asymmetric routing to ensure people in your organization can seamlessly use Office 365 as well as other important services on the internet. There are two common configurations customers have that cause asymmetric routing. Now's a good time to review the network configuration you're planning to use and check if one of these asymmetric routing scenarios could exist. To begin, we'll examine a few different situations associated with the following network diagram. In this diagram, all servers that receive inbound requests, such as ADFS or on-premises hybrid servers are in the New Jersey data center and are advertised to the internet. While the perimeter network is secure, there is no Source NAT available for incoming requests. The servers in the New Jersey data center are able to see both internet and ExpressRoute routes. We also have suggestions on how to fix them. The following diagram illustrates the asymmetric network path taken when your network configuration doesn't provide NAT for inbound requests from the Microsoft cloud over the internet. The inbound request from Office 365 retrieves the IP address of the on-premises endpoint from public DNS and sends the request to your perimeter network. In this faulty configuration, there is no Source NAT configured or available at the perimeter network where the traffic is sent resulting in the actual source IP address being used as the return destination. The server on your network routes the return traffic to Office 365 through any available ExpressRoute network connection. The result is an Asymmetric path for that flow to Office 365, resulting in a broken connection. The incoming request continues to enter through the New Jersey data center's perimeter network. This time Source NAT is available. The response from the server routes back toward the IP associated with the Source NAT instead of the original IP address, resulting in the response returning along the same network path. The incoming request continues to enter through the New Jersey data center's perimeter network. This time the prefixes advertised from Microsoft over the ExpressRoute circuit are not available to the New Jersey data center. The response from the server routes back toward the IP associated with the original IP address over the only route available, resulting in the response returning along the same network path. The following diagram illustrates the asymmetric network path taken when your network configuration doesn't provide NAT for inbound requests from the Microsoft cloud over ExpressRoute. The inbound request from Office 365 retrieves the IP address from DNS and sends the request to your perimeter network. The computer on your network routes the return traffic to Office 365 through any available ExpressRoute network connection. The result is an Asymmetric connection to Office 365. The incoming request continues to enter through the New York data center's perimeter network. This time Source NAT is available. At this point, you need to verify on paper that your implementation plan offers route symmetry for the different scenarios in which you'll be using Office 365. You'll identify the specific network route that is expected to be taken when a person uses different features of the service. From the on-premises network and WAN routing, to the perimeter devices, to the connectivity path; ExpressRoute or the internet, and on to the connection to the online endpoint. You'll need to do this for all of the Office 365 network services that were previously identified as services that your organization will adopt. It helps to do this paper walk through of routes with a second person. Explain to them where each network hop is expected to get its next route from and ensure that you're familiar with the routing paths. Remember that ExpressRoute will always provide a more scoped route to Microsoft server IP addresses giving it lower route cost than an Internet default route. If you're using a proxy server for internet bound traffic then you need to adjust any PAC or client configuration files to ensure client computers on your network are correctly configured to send the ExpressRoute traffic you desire to Office 365 without transiting your proxy server, and the remaining traffic, including some Office 365 traffic, is sent to the relevant proxy. Read our guide on managing Office 365 endpoints for example PAC files. The endpoints change frequently, as often as weekly. You should only make changes based on the services and features your organization has adopted to reduce the number of changes you'll need to make to stay current. Pay close attention to the Effective Date in the RSS feed where the changes are announced and a record is kept of all past changes, IP addresses that are announced may not be advertised, or removed from advertisement, until the effective date is reached. Your implementation plan should include both testing and rollback planning. If your implementation isn't functioning as expected, the plan should be designed to affect the least number of people before problems are discovered. The following are some high level principles your plan should consider. Stage the network segment and user service onboarding to minimize disruption. Plan for testing routes with traceroute and TCP connect from a separate internet connected host. Preferably, testing of inbound and outbound services should be done on an isolated test network with a test Office 365 tenant. Alternatively, testing can be performed on a production network if the customer is not yet using Office 365 or is in pilot. Alternatively, testing can be performed during a production outage that is set aside for test and monitoring only. Alternatively, testing can be done by checking routes for each service on each layer 3 router node. This fall back should only be used if no other testing is possible since a lack of physical testing introduces risk. Your deployment procedures should roll out to small groups of people in stages to allow for testing before deploying to larger groups of people. The following are several ways to stage the deployment of ExpressRoute. Set up ExpressRoute with Microsoft peering and have the route advertisements forwarded to a single host only for staged testing purposes. Advertise routes to the ExpressRoute network to a single network segment at first and expand route advertisements by network segment or region. 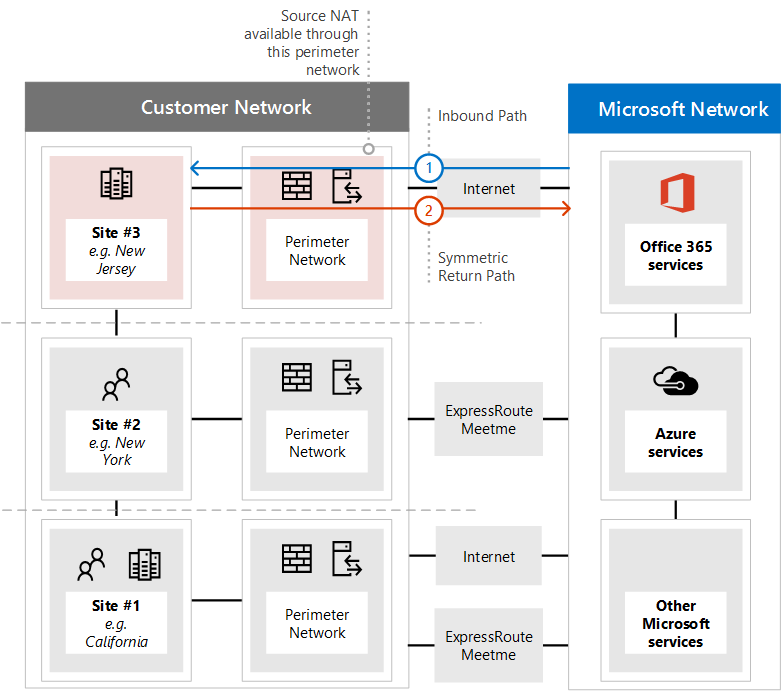 If deploying Office 365 for the first time, use the ExpressRoute network deployment as a pilot for a small number of people. If using proxy servers, you can alternatively configure a test PAC file to direct a small number of people to ExpressRoute with testing and feedback before adding more. Your implementation plan should list each of the deployment procedures that must be taken or commands that need to be used to deploy the networking configuration. When the network outage time arrives all of the changes being made should be from the written deployment plan which was written in advance and peer reviewed. See our guidance on the technical configuration of ExpressRoute. Updating your SPF TXT records if you've changed IP addresses for any on-premises servers that will continue to send email. Updating any DNS entries for on-premises servers if you've changed IP addresses to accommodate a new NAT configuration. Ensure you've subscribed to the RSS feed for Office 365 endpoint notifications to maintain any routing or proxy configurations. After your ExpressRoute deployment is complete the procedures in the test plan should be executed. Results for each procedure should be logged. You must include procedures for rolling back to the original production environment in the event the test plan results indicate the implementation was not successful. Your testing procedures should include tests for each outbound and inbound network service for Office 365 both that will be using ExpressRoute and ones that will not. The procedures should include testing from each unique network location including users who are not on-premises in the corporate LAN. Some examples of test activities include the following. Ping from your on-premises router to your network operator router. Validate the 500+ Office 365 and CRM Online IP address advertisements are received by your on-premises router. Validate your inbound and outbound NAT is operating between ExpressRoute and the internal network. Validate that routes to your NAT are being advertised from your router. Validate that ExpressRoute has accepted your advertised prefixes. Validate your public NAT IP range is not advertised to Microsoft through any other ExpressRoute or public Internet network circuit unless it is a specific subset of a larger range as in the previous example. ExpressRoute circuits are paired, validate that both BGP sessions are running. Set up a single host on the inside of your NAT and use ping, tracert, and tcpping to test connectivity across the new circuit to the host outlook.office365.com. Alternatively, you could use a tool such as Wireshark or Microsoft Network Monitor 3.4 on a mirrored port to the MSEE to validate you're able to connect to the IP address associated with outlook.office365.com. Test application level functionality for Exchange Online. Test Outlook is able to connect to Exchange Online and send/receive email. Test Outlook is able to use online-mode. Test smartphone connectivity and send/receive capability. Test OneDrive for Business sync client. Test SharePoint Online web access. Join to conference call as authenticated user [invite initiated by end user]. Invite user to conference call [invite sent from MCU]. Join conference as anonymous user using the Skype for Business web application. Join call from your wired PC connection, IP phone, and mobile device. Call to federated user o Call to PSTN Validation: call is completed, call quality is acceptable, connection time is acceptable. Verify presence status for contacts is updated for both members of the tenant and federated users. Using an open or flat network routing topology without source NAT in place. Not using SNAT to route to inbound services through both the internet and ExpressRoute connections. Not testing inbound services on ExpressRoute on a test network prior to deploying broadly. Stage your deployment to one segment of the network at a time, progressively rolling out the connectivity to different parts of the network with a plan to roll back for each new network segment. If your deployment is aligned with an Office 365 deployment, deploy to your Office 365 pilot users first and extend from there. Run the deployment steps to enable ExpressRoute. Test your seeing the network routes are as expected. Perform testing on each inbound and outbound service. Rollback if you discover any issues. Now that you have the completed plan on paper it is time to test at a small scale. In this test you will establish a single ExpressRoute connection with Microsoft Peering to a test subnet on your on-premises network. You can configure a trial Office 365 tenant with connectivity to and from the test subnet and include all outbound and inbound services that you will be using in production in the test subnet. Set up DNS for the test network segment and establish all inbound and outbound services. Execute your test plan and ensure that you are familiar with the routing for each service and the route propagation. As you complete the items described above, check off the areas you've completed and ensure you and your team have reviewed them before executing your deployment and testing plans. List of outbound and inbound services that are involved in the network change. Global network architecture diagram showing both internet egress and ExpressRoute meet-me locations. Network routing diagram demonstrating the different network paths used for each service deployed. A deployment plan with steps to implement the changes and rollback if needed. A test plan for testing each Office 365 and network service. Completed paper validation of production routes for inbound and outbound services. A completed test across a test network segment including availability testing. Choose an outage window that is long enough to run through the entire deployment plan and the test plan, has some time available for troubleshooting and time for rolling back if required. Due to the complex nature of routing over both the internet and ExpressRoute, it is recommended that additional buffer time is added to this window to handle troubleshooting complex routing. QoS is necessary to obtain voice and meeting benefits for Skype for Business Online. You can configure QoS after you have ensured that the ExpressRoute network connection does not block any of your other Office 365 service access. Configuration for QoS is described in the article ExpressRoute and QoS in Skype for Business Online . The first place to look is at the steps in this implementation guide, were any missed in your implementation plan? Go back and run further small network testing if possible to replicate the error and debug it there. Identify which inbound or outbound services failed during testing. Get specifically the IP addresses and subnets for each of the services which failed. Go ahead and walk the network topology diagram on paper and validate the routing. Validate specifically where the ExpressRoute routing is advertised to, Test that routing during the outage if possible with traces. Run PSPing with a network trace to each customer endpoint and evaluate source and destination IP addresses to validate that they are as expected. Run telnet to any mail host that you expose on port 25 and verify that SNAT is hiding the original source IP address if this is expected. Keep in mind that while deploying Office 365 with an ExpressRoute connection you'll need to ensure both the network configuration for ExpressRoute is optimally designed and you've also optimized the other components on your network such as client computers. In addition to using this planning guide to troubleshoot the steps you may have missed, we also have written a Performance troubleshooting plan for Office 365 .